Home Client Side Object Model (CSOM) Column PowerShell SharePoint SharePoint 2013 SharePoint 2016 SharePoint Online How to Make a Field Required in SharePoint List using PowerShell? How to Make a Field Required in SharePoint List using PowerShell? Requirement: Make a Field Required in SharePoint Online List. How to Set a List Field Required in SharePoint? 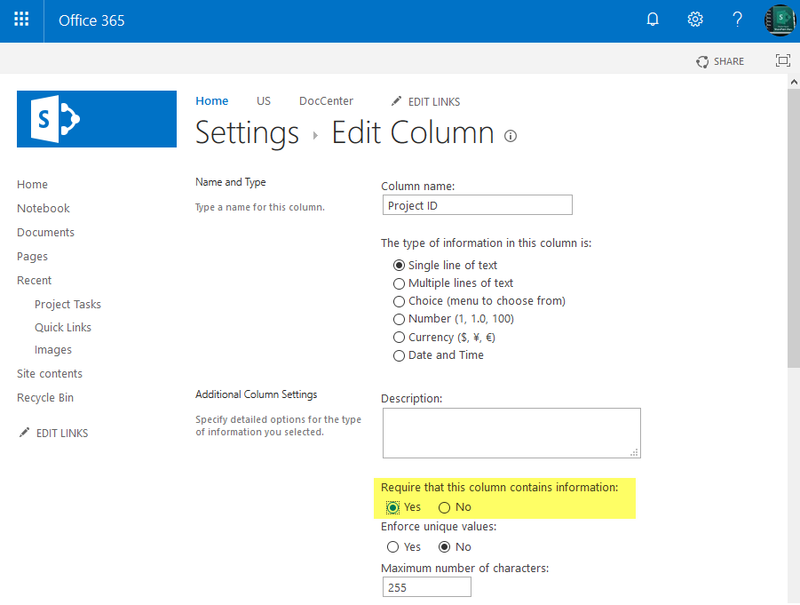 Set "Yes" for "Require that this column contains information"
Click "OK" to save changes. This makes the field required. Here is the PowerShell to set a column as "required"
Write-host "Field 'Required' Settings Updated!" Write-host "Field '$FieldName' Required Settings Updated!" Write-host -f Green "Field '$FieldName' Set to Mandatory!" Write-host "Field Required Setting updated!" This removes required field in SharePoint list (makes the field as non-mandatory).